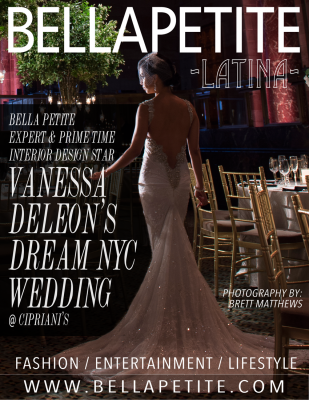 Every girl dreams of a fairy tale wedding, but the well recognized interior design star and our Bella Petite Latina interior design expert, Vanessa Deleon Bournias (5’2″ age 33) tall tales have turned into a reality. On June 15, 2014, Vanessa had a whimsical, magical dream wedding at the luxurious Cipriani’s, on 42nd Street in New York City. You may recognize Vanessa from “American Dream Builders,” “Restaurant Impossible,” “HGTV,” “Bang for your Buck” and “Spaces T.V.” Vanessa has been featured in numerous publications and talk shows and writes occasionally for several magazines including Bella Petite. However, Vanessa’s biggest production was this June, Roman numeral XV, which was a significant date, since it is the initials of the couple and, so they decidedly prominently incorporated them into the decor at their Cipriani dream wedding dinner event extravaganza! Where Vanessa married the handsome and brawny restauranteur Xaralanbos “Bobby” Bournias. How Vanessa met Bobby, was through a mutual friend at Son Cubano in Weehawken, New Jersey. Bobby proposed to Vanessa in their hotel suite, dropping to one knee, before their romantic sunset dinner on the beach in Anguilla. What Vanessa loves most about Bobby is his rough hard working exterior, but his keen balance of a loving, caring, compassionate interior. The fairy tale continues as the couple will honeymoon on the French Riviera, in the South of France. Now that’s a real life fairy tale come true! Vanessa’s timeless wedding look is inspired by her love of the classic elegance of fashion icon Coco Chanel. Vanessa’s dress is by the famous international Israeli designer, Inbal Dror, shoes by Christian Louboutin, veil by Maria Castelli and vintage jewels by Miriam Haskell selected by her mom for this affair of the heart to remember forever! LIKE IT, OR NOT? Tell us below. PARTICIPATE IN THE PETITE FASHION MOVEMENT! COPY AND PASTE UP THIS FABULOUS GRAPHIC INTO YOUR FACEBOOK TIMELINE COVER HEADER AND PROMOTE IT ON YOUR WEBPAGES. Join Bella Petite today and support the petite woman’s fashion and model movement. Bella Petite Magazine is Fashion, Entertainment and LifeStyle for Women 5’5″ Tall & under. “Petite is fit and full figured. Free to join us! It’s A Wrap! On Location with Bella Petite Cover Models! BELLA PETITE MAGAZINE Enter the Bella Petite Model Search. WIN an all expense paid photo shoot, high fashion spread and tearsheets for your book! Enter the ONLY model search in the world for petite women 5’5″ tall and under and get discovered!